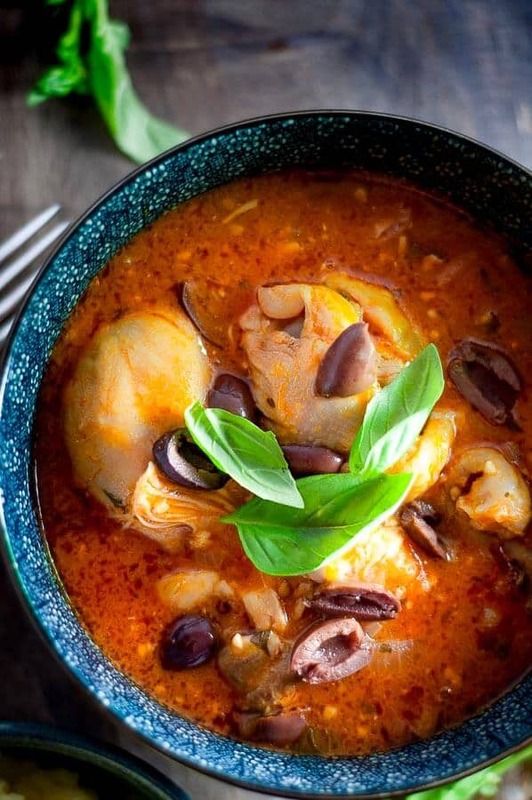 This Pressure Cooker Chicken Cacciatore is a healthy dinner under 500 calories that is packed with Italian spices, olives, basil and garlic. Its rich, aromatic and flavoursome and all cooked in the one pot. Perfect for midweek dinners, its on the table in under 30 minutes and the rich sauciness of this dish is perfectly paired with creamy mashed potato. 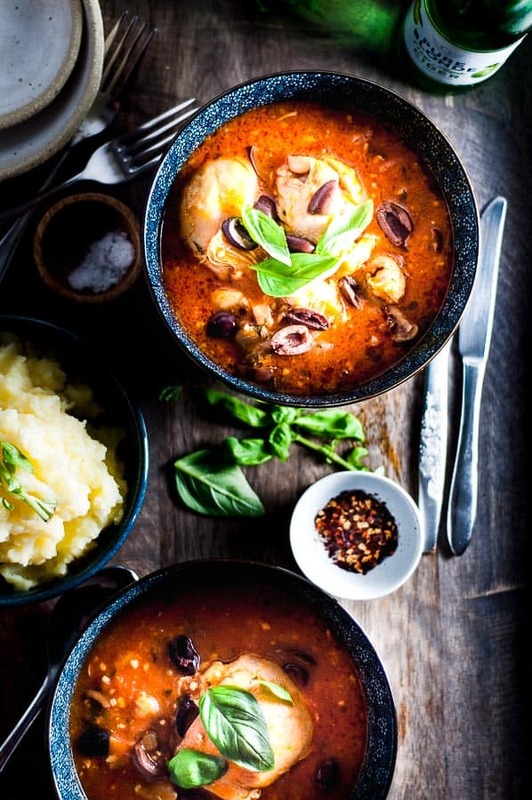 Chicken Cacciatore is an Italian dish with a rich thick tomato sauce. Traditionally it is flavoured with the core ingredients of anchovies, chilli, ginger, garlic, stock/broth, onion, tomatoes. This version also has a splash of white wine and a dash of orange juice to balance out the flavours. One of the things I love about this recipe is that you can use a combination of chicken thigh and chicken drumsticks. I’m not really a fan of meat with bones but my husband loves it. So this dish suits us both as I get the thigh pieces and he has the drumsticks. 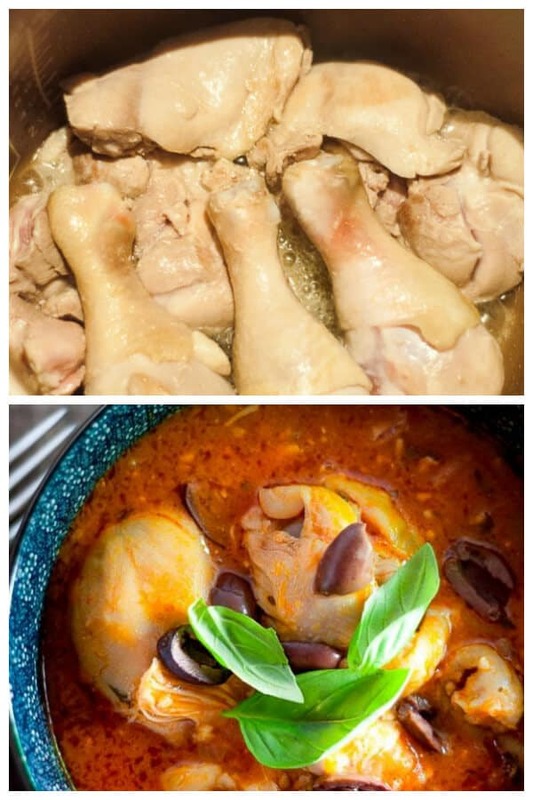 PRO TIP: Using a meat that has a bone in helps to add additional flavour to the dish, so even though I’m not fond of drumsticks, I always make Chicken Cacciatore with drumsticks and thighs for maximum flavour. I used to make Chicken Cacciatore in the Slow Cooker for years until I got my Pressure Cooker, and now that is the only way I make it. I actually think I get better results using the pressure cooker as the chicken holds together better and I don’t need to be as organised with getting it all ready in the morning. 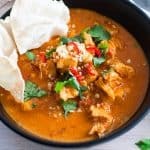 Using the slow cooker meant I could only ever make this dish on weekends. Now that I have my trusty pressure cooker, I can make it midweek and have it on the table in a respectable 40 minutes. All the flavours are there, just the same as it would be as if it had spent 8 hours slow cooking. 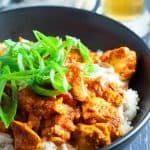 More Pressure Cooker Recipes: >>>>> Pressure Cooker Massman Beef Curry, Pressure Cooker Mexican Beef Taco Bowls, Pressure Cooker Chicken Korma Curry. Don’t skip the anchovies – they’re basically a tiny fish that has a very strong flavour usually preserved in oil and salt. 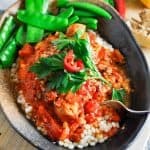 I personally don’t even like them, but when they are cut up and added to Chicken Cacciatore they add a depth of flavour that you can’t get from anything else. The anchovies round out the dish and make it complete and they dissolve to nothing, leaving a rich complexity in the sauce that makes it undeniably moreish. Trust me, there are no fishy bits in the finished dish or fish after taste. 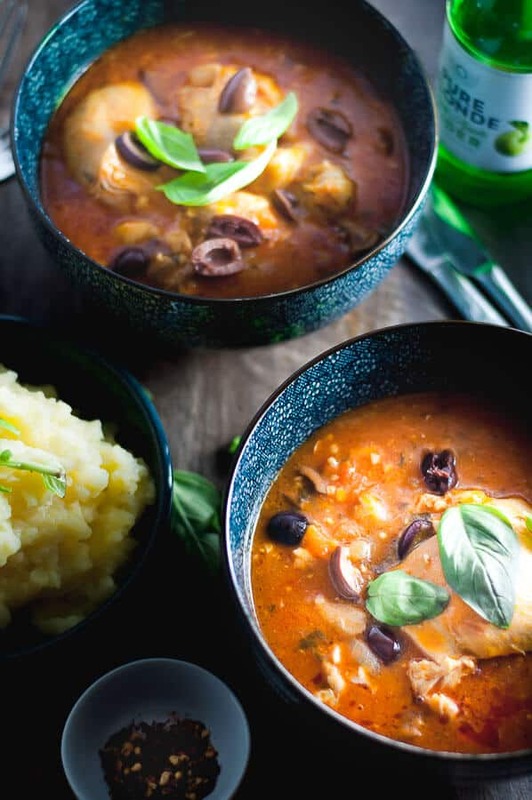 The pairings for this kind of wholesome rich Italian dish are endless, but here are some of my favourite ways to enjoy Chicken Cacciatore. Thick creamy white mashed potato with a hint of butter, garlic and salt. The best way to soak up those juices. Quinoa mixed with brown lentils for an even bigger protein hit. Great for when you want this dish to go further. Brown Rice if you’re looking to keep things above board and on the healthy side. Also a more filling option and great if your reheating the next day. Spaghetti or other pasta. Harder to soak up the juices with this one, but it’s keeping the Italian theme real. Add the olives at the end after cooking. Adding them before will make then soft and squidgy. Thicken the sauce with a cornflour slurry after cooking. To make: ¼ cup finely diced parsley, 2 tablespoons crushed garlic, 1 medium preserved lemon finely diced, salt to taste. 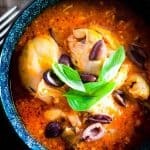 This Pressure Cooker Chicken Cacciatore is a healthy dinner under 500 calories that is packed with Italian spices, olives, basil and garlic. Its rich, aromatic and flavoursome and all cooked in the one pot. Brown Chicken: Press SAUTE/SEAR HIGH TEMP button cook for for 10 minutes, keeping the lid OFF. Once chicken is browned off, add the onion, tomato, garlic, ginger, anchovy, chilli flakes and cook until onion and tomato softens soft – about another 4 to 5 mins on the SAUTE/SEAR HIGH TEMP setting. Add all remaining ingredients (except potatoes): wine, stock/broth, passata, orange juice, basil, salt and cream. Stir the ingredients to combine. When you are finished with the chicken and it is cooking in the pressure cooker, Get the potatoes on. Half fill a saucepan with water and set stove temperature to high. Peel and chop potatoes roughly and add to saucepan. Once chicken is cooked and timer has gone off, release pressure valve and remove lid. If it looks like the sauce needs thickening, make a cornflour slurry by adding the 2 tablespoons of cornflour to 2 tablespoons of water and mix together. Add to the sauce and stir in with a spoon until it gradually thickens. Stir in the chopped olives. Test the potatoes are cooked using a skewer or fork. If it goes through, they are ready. Mash the potatoes with ½ cup of milk and 2 tablespoons of butter. Salt and Pepper to taste. Serving up: Serve the chicken with a generous amount of the sauce, mashed . Set the Valve to “Seal” position and check that the float valve is in the down position. Instead of potato, you could try, pasta, spaghetti, cous cous, or brown rice .